We strive hard to render excellent and reliable personalized in-home care. Encourage independence, allowing elderly to be in their own homes by providing first class professional care with Respect, Dignity and Highest Ethical Standards. Our employees are our most important resource. Through fair compensation and excellence in leadership, we are attracting exceptional individuals and will provide for their personal and professional growth. Employees who achieve excellence in their work will be recognized and rewarded. Excellent service to our clients, their families is our most important consideration. Comfort – Keeping our client’s health, quality of life and well-being are central in delivery of services. Affection – Treating and interacting with our clients with respect, dignity, compassion and empathy. Respect – Showing respect for all cultures, religions, ethnicities; sexual orientation, ages, gender and disabilities. Integrity – Treating our clients with honesty and integrity while recognizing and maintaining confidentiality of client information. Nurturing – a work environment that encourages personal enjoyment and enhances job satisfaction and performance through recognition and rewards. Generosity – provide our clients a selfless, good hearted staff, who are not only adhering to the professional Code of Ethics of the home care industry but also generous with their care and compassion. Our non-medical, personal care and companionship services help families and their loved ones to preserve independence. We can provide an hourly or live-in care. There are no long-term contracts and care schedule can be adjusted at any time. Licensed in Pennsylvania and proud members of Pennsylvania Homecare Association. Conduct criminal background check,exclusion check verification & TB screening on all employees before assigning them to clients. 60 hours of Customized Training (in-class, audio, video and on-line) includes: Communication skills, ADLs & IADLS, Care Plan (weekly documentation/activities), Personal Care, Adaptive Equipment for Transfers, Basic Hygiene and Infection Control, Personal and Environmental Safety Precautions, Emergency Procedures (basic First Aid and Client’s emergency preparedness plan, Confidentiality of Client Personal, Financial and Health Information, Understanding Abuse and Neglect, Stroke Care, etc. Continued education is a must! Maintain current General and Professional liability, Bonding and WC insurance for all employees. Solely responsible for employee’s salaries, benefits, federal, state and local taxes, and unemployment insurance contributions. Create unique approach for every customer, customizing Care Plan per true need. 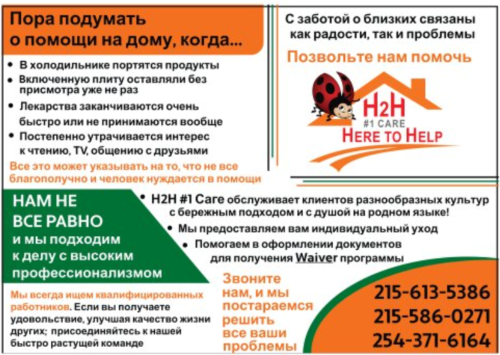 To inquire about any of the support we provide, we may be reached at 215-613-5386. A free home assessment can also be requested online.